One of the great joys of being a cineaste is discovering something that truly moves you. Sometimes, you come across a film that strikes such an emotional chord that it borders on a religious experience. It opens your mind to different people and cultures, transporting you to a time and place that exists within the imagination. You’re reminded why you call yourself a “movie fan,” because being one involves that constant search for enlightenment – to have that theatrical experience that stirs your soul and reignites the spark that made you so passionate to begin with. 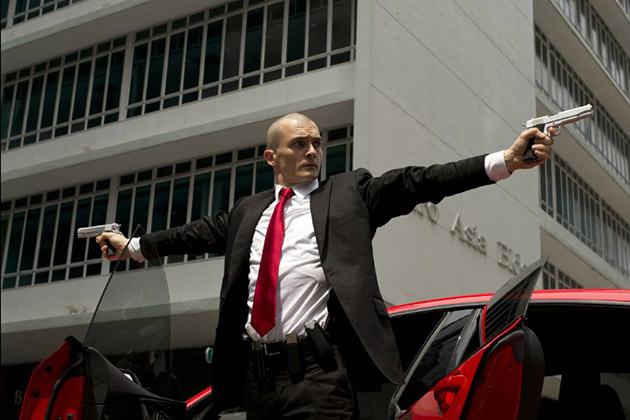 But then you come across something like Hitman: Agent 47 (2015). Oh boy. This latest adaptation of the video game franchise should have taken notes over what happened with the Timothy Olyphant-starring vehicle back in 2007. Video game movies have not had the best track record (to put it mildly), and this reboot doesn’t do much to change that. Directed by Aleksander Bach with a screenplay by Michael Finch and Skip Woods, the narrative here is so thin with such little substance that the hour and a half runtime feels like it goes by in thirty minutes. It’s about as generic as you can get as an action thriller, with characters that are flat and set pieces that are ludicrous and forgettable. The issue video game movies have yet to solve is the lack of immersion for the spectator. When someone plays a game, they project themselves onto the characters they are playing, allowing them the feeling of being a part of the action. When a game is translated to the big screen, the controller is essentially removed out of the player’s hand. Therefore, that connection is severed. We have to rely on storytelling to keep us locked in: character development, engaging storylines, tangible stakes to build suspense, etc. 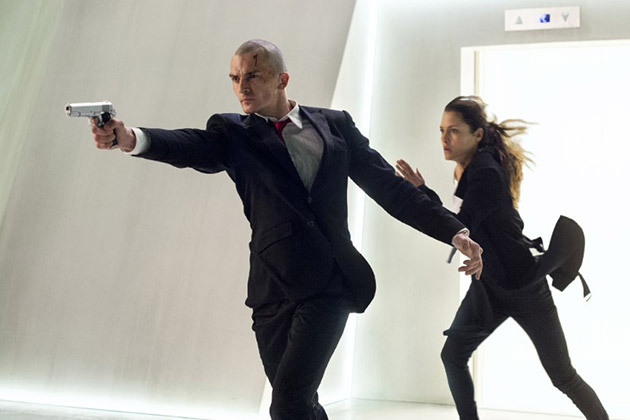 The central character here, known only as Agent 47 (Rupert Friend) is nothing but a blank slate. He has no personality, nothing unique to make him stand out. Sure, as an assassin he’s adept at shooting guns and beating people up, but every time he opens his mouth he sounds like a computer. This time around, The Terminator Agent 47’s task is to help a woman named Sarah Connor Katia (Hannah Ware) find and protect her son John father Litvenko (Ciaran Hinds). Litvenko was the man who discovered the genetic code that created the Agent program, endowing members with superhuman strength, skills, and intelligence. For a reason that is never explained, Litvenko is the only person on earth who knows this information – because he apparently never wrote anything down, kept any records, or mentioned it to other people. And so, our two protagonists go on the hunt, while a dangerous organization named Skynet the Syndicate are hot on their tails, wanting Litvenko for their own dastardly purposes. And that’s really about it in terms of plot. All the rest is filled action set pieces that are so heavily reliant on bad CGI that it looks like we’re watching a video game. Whether it’s due to time or a limited budget, the action gets handcuffed by phony computer renderings. In scenes were characters tumble on the ground, they flop around like fish out of water. When vehicles explode, they move and contort in such a way that resembles clay instead of hard metal and steel. The screenplay doesn’t do much to help the special effects, either. If there was an issue with time or budget, then it may not have been the best idea to construct an action scene where people get sucked into a jet engine. Doing so calls attention to how bad the CGI actually is. Hannah Ware does the most she can in the role of Katia. Unfortunately, a lot of the time Katia acts like a deer in headlights, following Agent 47 around and doing everything he tells her to. She does her best to provide nuance to her performance, juggling her desire to find her father and come to terms with her own identity. Ciaran Hinds does his usual strong work as Litvenko, although he doesn’t really have much screen time to make that big of an impression. Zachary Quinto also shows up as the appropriately named John Smith, a “good guy or bad guy” agent who has a lot of interest in Katia and her father. I wish there were more to say about the performances, but the writing doesn’t give the actors much to work with outside of running, jumping, shooting, and punching. The worse offense Hitman: Agent 47 commits is by being completely average. If this were extremely bad it could have solidified as a kind of niche movie, perhaps garnering a cult following. Heck, even Plan 9 From Outer Space (1959) has its fans. But that is not the case this time. There is such a lack of identity with this undertaking that I’ll be surprised if anyone remembers it a month from now.